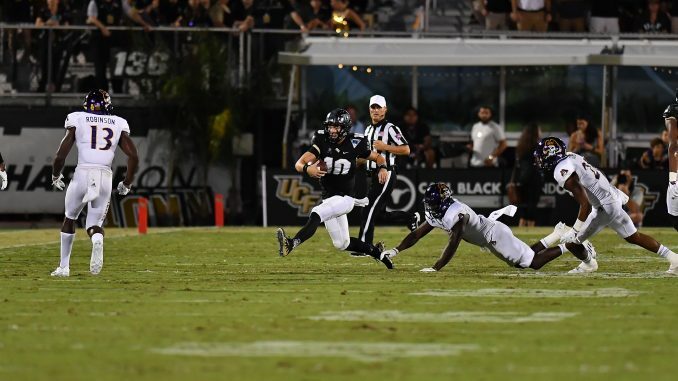 After a string of challenging matchups with North Carolina, FAU, Pittsburgh, SMU and Memphis, UCF will run into a struggling East Carolina program in Greenville on Oct. 20. Pirates coach Scottie Montgomery is 6-18 in his two years with the program, meaning he will enter 2018 on the hot seat. The Knights have won four of their last five against ECU and it would be a disaster if they didn’t make that five of six by the end of this year. There weren’t a lot of bright spots last year for the Pirates, who picked up their only wins against UConn, BYU and Cincinnati. The offense was their strong point, though they only scored 24.9 points per game. Gardner Minshew and Thomas Sirk split time at quarterback, combining for 3,795 passing yards and 25 touchdowns to 16 interceptions. That’s nothing extremely special, but it wasn’t anything close to ECU’s biggest problem. The offense as a whole played well enough to win more than three games. This year, the Pirates will have to replace that combination of Minshew and Sirk. No. 1 receiver Trevon Brown is back this year after catching 60 passes for 1,069 yards and seven touchdowns last year. He will make the new quarterback’s job much easier, especially if he keeps up his 17.8 yards per catch average from a year ago. The rest of the returning receivers failed to do much of anything in 2017, but there is some promise there. Tahj Deans (16 catches, 177 yards, two touchdowns last year) and Deondre Farrior (24 catches, 211 yards, three scores) will need to excel in bigger roles if the ECU offense wants to repeat and build on last year’s effort. The 2018 backfield features the top two rushers of the 2017 group, but that group didn’t exactly see a lot of success. Hussein Howe (419 yards, three touchdowns) and Darius Pinnix (229 yards and two touchdowns) are back at the top of the depth chart, but the team is also hoping for a triumphant return from Anthony Scott (859 career rushing yards, six touchdowns) after he missed 2017 due to academic reasons. The linemen up front should be just fine, but can the running backs find some sustained success this year? There are plenty of questions for ECU to answer on offense, with little experience at receiver behind Brown and a group of questionable runners in the backfield. However, there’s still the question of who will start at quarterback. Reid Herring (20 yards, one touchdown) is the only returner with game experience, but redshirt freshman Kingsley Ifedi and true freshman Holton Ahlers will also receive looks. Even if those questions are answered on offense, will it really matter if the defense looks like it did in 2017? The answer is no. Last year’s defense was the nation’s worst, allowing 45 points and 541.7 yards per game. Both of those marks really left them 129th—dead last—in both categories. David Blackwell is the group’s new defensive coordinator after having success at Jacksonville State, but his inheritance in Greenville isn’t too good. With most defenses, even ones that saw struggles a year ago, at least one significant returner usually sticks out. That isn’t the case with ECU. The team leader in sacks last year is gone. The interceptions leader from 2017 was linebacker Aaron Ramseur, who only had two. He is back, as is safety Devon Sutton, who tallied three tackles for loss last year. Neither of those guys necessarily qualify as a marquee player. The entire defense is one big question mark for the Pirates, which is scary after what they saw last year. On special teams, ECU is having to replace punter Austin Barnes (44 yards per punt, 16 kicks inside the 20). Kicker Jake Verity (16-for-25 on field goals, 35-for-36 on extra points) is back, while Trevon Brown will most likely keep the kick return job. ECU is in a tough spot right now. It’s hard to see this team surpassing its win total from last year, which has to mean that Montgomery will lose his job after just three seasons. Recruiting-wise, the Pirates seem to be doing okay on paper. But that hasn’t translated into victories in the last two years. With no clear answer at quarterback, running back or anywhere on the defense, 2018 might be another painful year for the program. Final Thoughts: The Knights should absolutely roll in this one, even without their best effort. The Pirates look like a mess heading into this year, so there’s no reason to think they’ll be able to match up well with an experienced team like UCF. The ECU defense won’t be able to stop McKenzie Milton and his extensive arsenal of weapons. Even if the Pirate offense is figured out by the time this game rolls around, it won’t be able to hang. This is one of those games that the Knights should have locked up by halftime.